This year in Robinson, we celebrate our 15th birthday. Wowzer. About everything has changed in the last 15 years, The popcorn machine and the seats are about the only original equipment. They've got to go. We've survived a sprinkler flood, conversion to digital and 3D, and we've navigated the stresses that come with providing movies in an environment that now includes Netflix, Amazon Prime, and every other shiny penny that can entice you to watch movies IN THE WRONG PLACE! We are not afraid to admit that we need your help to replace our seats this year, and make any future admission price increases as gentle as possible. If you throw in an extra buck, or five, or twenty when you come to the theater, we will give you one or a bunch of raffle tickets for our summer drawing for a chance to win free movies for a whole year and tons of other prizes. Contribute $50, $100, or $150 and we've got extra special goodies, including not only raffle tickets, but passes, and concession items. Best of all, your name will go on a Wall of Stars. Want to make an impact for the next 15 years? We are selling naming rights to each auditorium until we do this again... in 2034. You can name one of our three small auditoriums for $2,500, or one of the two large ones for $5,000. 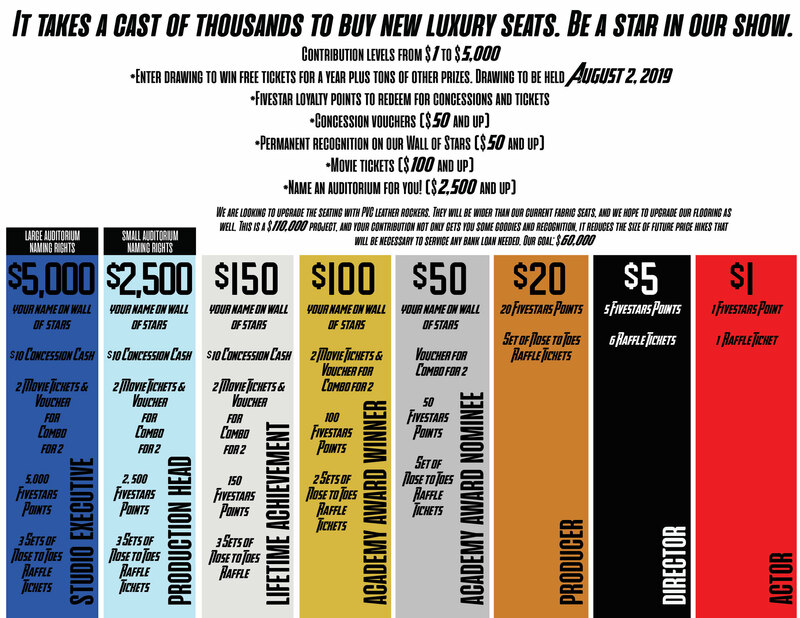 Help us celebrate both the past 15 years and the next 15 with a gift of between $1 and $5,000 to keep the theater shiny and new.